There are seven legislative assembly constituency in Ballia district for the 2017 Assembly elections. They are 363 Bairia, 361 Ballia Nagar, 362 Bansdih, 357 Belthara Road, 360 Phephana, 358 Rasara, 359 Sikanderpur. When Uttar Pradesh assembly election 2017 is getting ready to electios new Assembly, Ballia is not anywhere behind in the election heat. Ballia district (Hindi: बलिया ज़िला, Urdu: بلیا ضلع‎) is one of the districts of Uttar Pradesh state, India. Ballia district is a part of Azamgarh Division situated in eastern Part of Uttar Pradesh. Main occupation is agriculture. Ballia City is district headquarters and commercial Market of this district. 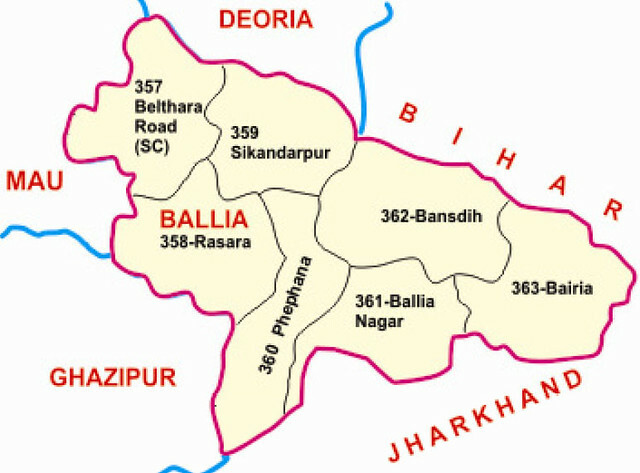 There are six tehsils (talukas) in this district viz Ballia, Bansdih, Rasra, Bairiya, Sikandarpur, and Belthara. Rasra is second major commercial area of district.